An international forum for people interested in modern high performance road going sidecars. :: View topic - Alternative transportation??? Posted: Tue Dec 21, 2010 12:30 am Post subject: Alternative transportation??? your sidecar to get all my luggage stowed!!! 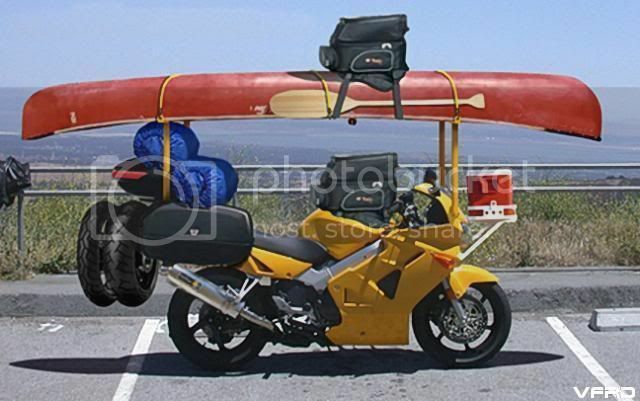 His VFR is red, so it's not his bike, but this does show some ingenuity in maximizing luggage stowage. Would be even more if turned the canoe other side up. And then put it on a frame with a wheel by the side of the bike.